Rational partners could attract a new breed of customer for a compact version of its flagship SelfCookingCentre. 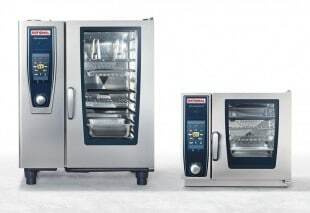 The German giant’s combi ovens are found in almost half of all commercial kitchens in the UK, and the reduced footprint of its XS model could make it even more popular. Rational claims the XS model contains the full power and intelligence associated with its larger units, but in a footprint that is just 555mm deep, 655mm wide and 567mm high. It has succeeded in expanding its range to incorporate a 2/3 GN unit, which takes up a space on the counter or bench of just 0.2 metres squared. The XS, which was unveiled to UK partners at a special launch event in Twickenham this week, also comes with an integrated fresh steam generator. Götz Sauer, executive VP of Rational, says that although it is the smallest unit in the SelfCookingCenter family, it is in no way inferior to the larger units in terms of features or performance. This is because it is equipped with a fresh steam generator and comprises all the familiar Rational tools, such as iCookingControl, iLevelControl, HiDensityControl and Efficient CareControl, its automatic cleaning and descaling system. “Our units impress with their performance and precision, and together with the benefits of the fresh steam generator Rational represents top food quality and we make no compromises in this regard,” says Sauer. Rational sees the XS as a way of getting its brand into a range of new customer bases, including supermarkets, petrol stations, cafés and coffee shops, or indeed any situation where space is at a premium. It also believes it is ideally suited as a station unit in an à la carte scenario. A full range of cooking accessories have also been produced in the appropriate 2/3 size, including grilling and pizza trays, cross and stripe grill grates, and roasting and baking trays. • For the first time, the SelfCookingCenter with fresh steam generator is also available in XS size. • Intelligent cooking power offered in a 6 x 2/3 GN footprint. • Full range of cooking accessories developed in the appropriate 2/3 size. • Start screen has been modified and faster CPU is designed to improve operational usage. • New features include rack signalling, whereby a blinking LED light signals which rack needs to be loaded or unloaded.